The week of February 5-9th 2018 I was one of four representatives of the Greek Orthodox Metropolis of Toronto (Canada) at a multi-city Youth Interfaith Initiative hosted by the Armenian Holy Apostolic Church’s Canadian Diocese and funded by the Colonial Government of Canada. On Tuesday, February 6th, I and the other Youth representatives from the Greek Orthodox got to speak a bit. When it came to my turn, I introduced myself: I’m a second-year seminarian, a convert, married etc. and I chose to say what I felt was ultimately lacking in representation at this interfaith dialogue: Christ. Below is basically what I said. As an Indigenous person, a Métis (as is my wife), I hear a lot about social justice in the media and the academic side of Indigenous issues. But I don’t care about “social justice.” As a Métis raised by a single mother of four, I do not care about social justice. And what is the point of interfaith dialogue? If it is just to alleviate suffering, then this is where dogmatic differences come into play. I believe that water seeks its own level, that teaching a man to fish feeds him better than giving him fish for a day. How does that connect to Christianity? Well, Orthodox Christianity doesn’t teach you to escape suffering like Buddhism does. It trains you to endure suffering, to endure the days you don’t catch any fish, or when someone steals your fish, or when you go hungry because you gave your fish to someone else. The problem with interfaith dialogue is that our end goal is ultimately not the same because our path and destinations are different. Orthodox Christianity teaches that the point of all of this is θέωσις, to become by grace what God is by nature. Not the eliminating of suffering, the metamorphosing of suffering and our union with Christ. To be with Christ, that is the direction. *Ferreiro, Alberto and Thomas C. Oden, eds. The Twelve Prophets. Vol. 14 of Ancient Christian Commentary on Scripture. ICCS/Accordance electronic ed. Downers Grove: InterVarsity Press, 2003. Therefore he who would find Christ must first find the Church. This caused me to pause a second as I composed myself before I answered, as this is a delicate topic—not just when speaking with Protestants, but with converts from Protestantism, and even with many cradle Orthodox as well. The definition that the Church is composed of all those who believe in Christ is a recent invention of Martin Luther and an idea that, if false, has far-reaching implications for salvation; therefore, the fact that Luther was wrong is of paramount importance. The origins of the Orthodox Christian Church can be traced in history from it’s “founding” at Pentecost; furthermore, one can begin to see the blueprint with Christ’s words to St. Peter in Matthew 16:18, “κἀγὼ δέ σοι λέγω ὅτι σὺ εἶ Πέτρος, καὶ ἐπὶ ταύτῃ τῇ πέτρᾳ οἰκοδομήσω μου τὴν ἐκκλησίαν, καὶ πύλαι ᾅδου οὐ κατισχύσουσιν αὐτῆς.” Following the Lord’s Great Commission and Ascension to the right hand of the Father, the Apostles went out and grew the Church by founding the Apostolic Sees, all of which are still in existence to the present day. 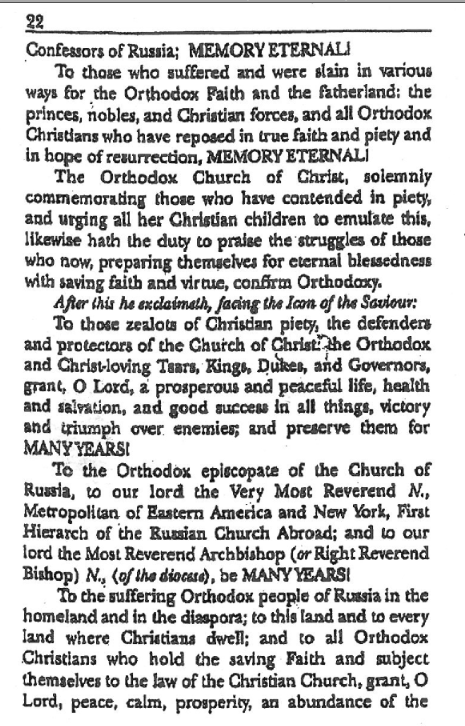 In all parishes which grew from the Apostolic Sees one will hear chanted or read the Symbol of Faith that Orthodox Christians have been reciting for over 1600 years, in which we confess not only the belief that the Church is one, holy, catholic, and Apostolic, but also “an affirmation of belief which is not found in modern Protestant confessions: belief in the Church. 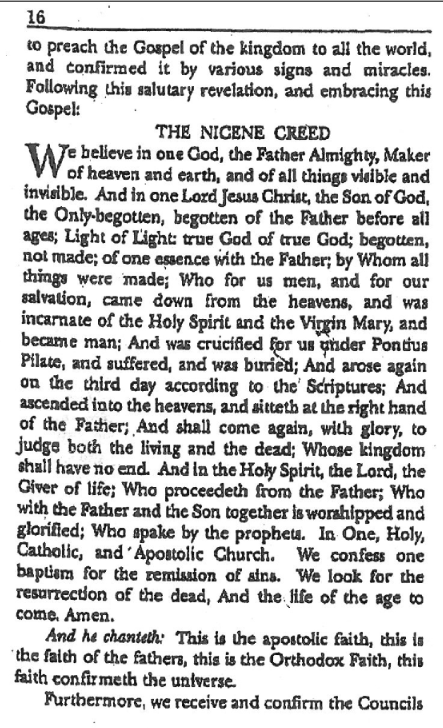 In the Nicene Creed, the [Orthodox] Church confesses belief . . . in one, holy, catholic, and apostolic Church. Thus for the ancient Church, the Church Herself was an object of faith and a subject of credal affirmation. The early Church confessed belief in the Church Herself, even as She confessed belief in God,” as Clark Carlton relates in The Way. Further to the point, up until relatively recent times everyone (Orthodox, schismatics, heretics etc.) 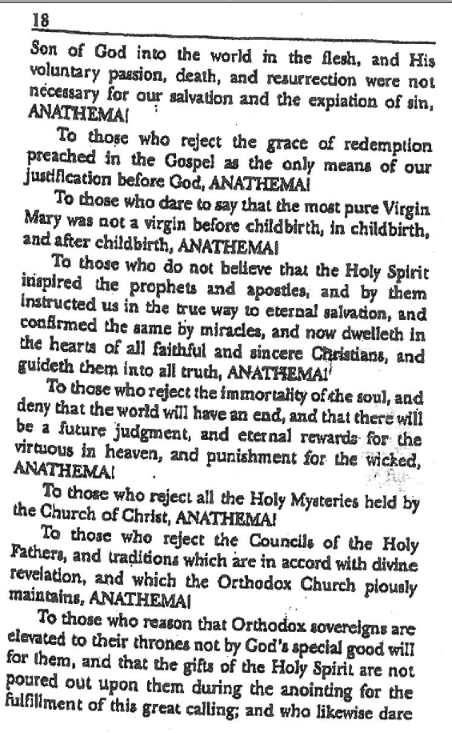 believed that outside the Church there was no salvation, membership being attained via baptism (with membership being distinct from salvation, but baptism necessary for salvation), that their church was the Church, and the relationship between the Church and others was one of schism, heresy, a combination of both, or excommunication/anathema. Nonetheless, there was a distinct belief that the Church was a visible body of believers of whom you could go to receive initiation. The quickest way to find out whether or not the particular group you are attending is the same Church spread by the Apostles is to go back through history. I’ll use two examples: the group my stepsister-in-law attends, and the group I nominally grew-up in. My stepsister-in-law attends Southland Church in Steinbach, MB; it doesn’t go back very far, and visiting their website doesn’t yield any information about it’s founding nor even where their leaders were educated or by what authority they do what they do. From the article I linked in the Intro we learn a little bit more about their pastor but still nothing substantial about their origins other than that it was already in existence in 1996, and since Steinbach was only founded in 1874 we have a time frame—though I highly doubt they existed for too long prior to 1996; regardless, we can trace the beginnings of their beliefs due to them being a “Non-Denominational Evangelical” group. First we must realise that the phrase “Non-Denominational Evangelical” is a misnomer as well as an oxymoron; “Non-Denominationalism” (or “Nondenominational Protestantism”) meaning that the Non-Denominational group is independent in almost all matters, including dogma, whereas “Evangelicalism” is a trans-denominational movement within Protestantism (e.g., the Evangelical Lutheran and Evangelical Mennonite denominations). If an [North] American church calls itself “non-denominational,” nine times out of ten what that means is Baptist. 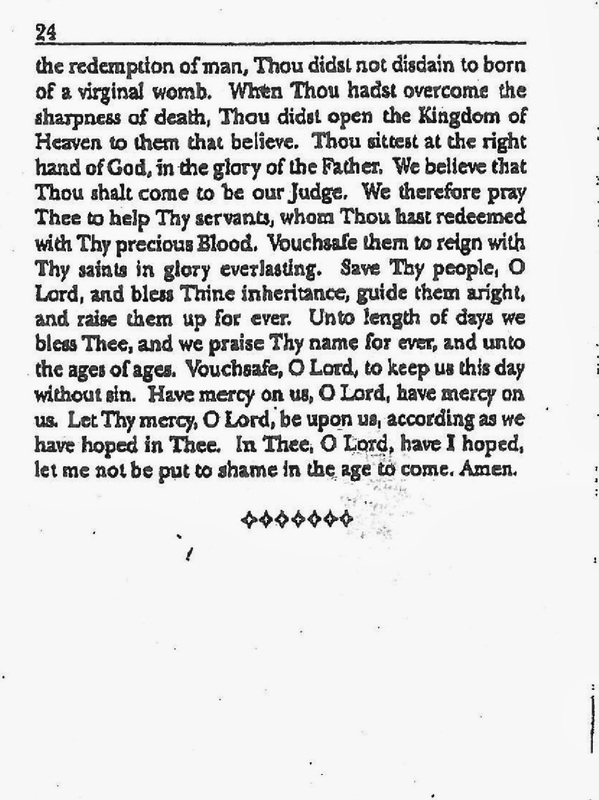 Altar calls and appeals to personal conversion replace the sacraments as the means of grace. Baptism is a symbol of one’s personal conversion, nothing more, and it is only appropriate for adults. “Evangelicalism” on the other hand is much more clear, originating in the 18th century in Britain and it’s American colonies amongst descendants of the Radical Reformation, then eventually spreading to those descendants of the earlier Protestant Reformation. My second example is the Blumenort Evangelical Mennonite Church in Blumenort, MB, the religion I grew up in, at least nominally. The history of this group is hard to follow, full of migration, name changes, and schism, but to the best of my knowledge, the origins of this group come from Mennonites in the Netherlands splitting into Frisian Mennonites and Flemish Mennonites in 1566. On 1 September 1801 Klaas Reimer was elected minister of the Flemish Danzig Mennonite religion and eventually ended up in the Molotschna Mennonite settlement in southern Russia, wherein 1814 he and some followers broke away from the Flemish Mennonites and founded the Kleine Gemeinde. After immigrating to Canada the Kleine Gemeinde in Manitoba changed their name to Evangelical Mennonite Church in 1952, which in 1960 was changed to Evangelical Mennonite Conference. As we can see from the above two examples, neither of them can be traced to any of the Apostolic Sees. Compounded to this is the obvious fact that the two groups previously mentioned are in fact two and not one, the dogmatic differences being obvious when one realizes that the current lead pastor of Southland is a former Mennonite Brethren (another Mennonite schismatic group founded in 1860 in the Molotschna settlement). So far we have been shown that the Church is singular and not plural (just as St. Paul teaches in Ephesians 4:4-6), that the oneness of the Church has always been proclaimed and believed, it’s history traceable through the Apostolic Sees and thus can be seen and found. The question obviously arises then as to what exactly ‘the Church’ is; the answer being found in Colossians 1:18 and Ephesians 1:22-23 where we are told that the Church is the Body of Christ. With this answer it is obvious why it matters whether or not one belongs to the Church of the Apostles as opposed to the ideology of Martin Luther, Menno Simon, Klaas Reimer, or Ray Duerksen: because if you don’t belong to the Apostolic Church, you are not apart of the Body of Christ. 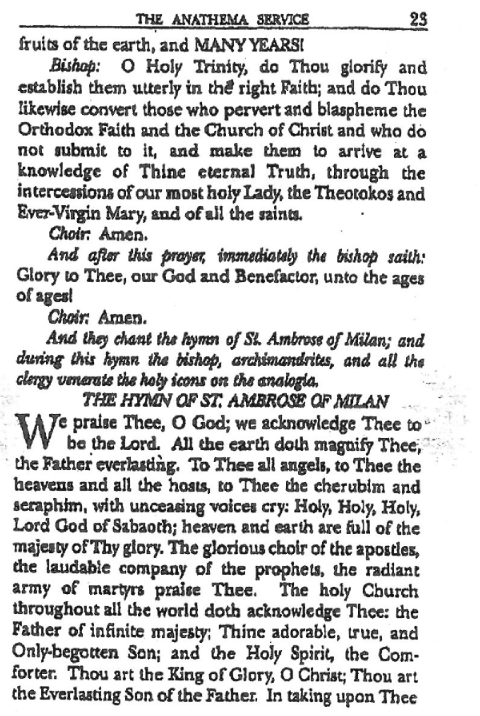 The historic belief in the oneness, catholicity and Apostolic authority of the Church can be clearly seen amongst the writings of the Apostolic Fathers, especially St. Ignatius of Antioch’s (himself a student of St. John the Apostle) Epistle to the Smyrnaeans; this, coupled with the fact that traditional Protestants accepted the authority of the Ecumenical Councils one has to wonder when the modern Protestant misunderstanding of the Church diverged from the historic understanding of the Orthodox Church, and for this it would be best to begin where the Protestants began: the Roman Catholic heresy. This was the idea believed by Martin Luther when he began his protest against the Roman Catholic heresy: he had no plan to found a new ‘Church/church’ (which was impossible, since the Church is one, as he confessed in the Papist distortion of the Symbol of Faith), but rather to correct what he perceived were errors the Roman Catholic religion was making; therefore, when he was excommunicated on January 3rd, 1521 he found himself—despite his alleged belief in Sola fide—without the possibility of salvation. Martin Luther did not voluntarily leave the Roman Catholic Church; he was excommunicated. Once he found himself on the outside looking in, however, he was forced to rethink the very definition of the Church. For this self-authenticating Church, Luther would substitute a Church composed of those who hear and accept God’s Word. He even held that the term “kirche should be discarded . . . [and] replaced by the word gemeinde [community, congregation] [now, doesn’t that word look familiar?-Thomas S.],” the idea being that the authoritative institution would give way to a group of Christians who gather themselves about the Word. More than a thousand years before Luther’s Reformation, St. Augustine had said, “For my part, I should not believe the Gospel except as moved by the authority of the catholic Church” For him, as for the other Fathers of the early Church, the truth of the Gospel was confirmed by the living experience of the Church which is Christ’s very Body upon earth, animated by the Holy Spirit. Luther, however, turned St. Augustine’s theology of the Church on its head. For him, it is the Word—that is, the Gospel of grace and sola fide, not the actual text of the Bible—that validates the Church. In order to justify his distinction between the true Church and an earthly institution, Luther invoked the distinction made by St. Augustine between the visible and invisible Church. Augustine developed his theory in response to the Donatist heresy, which was plaguing the Church in North Africa. The Donatists argued that the validity of the sacraments—indeed the very legitimacy of the Church herself—was dependent upon the moral purity of the clergy. Thus those leaders who had lapsed under persecution had, according to the Donatists, polluted the whole Church. 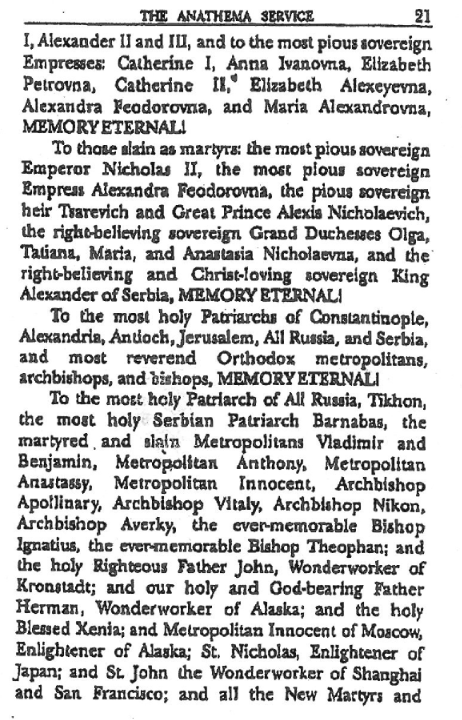 The Donatists thus created their own, “pure” church. St. Augustine argued that the holiness and legitimacy of the Church was due to the holiness of Christ, not the holiness of Her several members. His famous statement that there may be some in the Church who are not truly in the Church and some outside who will ultimately be revealed as being truly in the Church was meant to safeguard the legitimacy of the historical, catholic Church—in opposition to the claims of the Donatist counter-church. Because one mark of the Church is the validity of its saving knowledge, it becomes extremely important for Luther to distinguish between the true Church of the Word and the Church of mere outward form. Using the Augustinian formula of invisible Church as opposed to visible Church, the great Reformer is able to claim that “the essence, life, and nature of Christendom is not a bodily assembly but an assembly of hearts in one faith.” It would be difficult to imagine a more docetic view of the Church [here in the text Carlton gives another relevant footnote for us: “Lee, p. 57. Docetism is the heresy that the Word of God did not truly take upon Himself human flesh. Therefore, his humanity is in appearance only, not in reality. Thus, according to Lee, this idea of Luther’s discarnates the Church as the Docetists tried to discarnate Christ.”]. There is a considerable degree of irony here, however. For, when Luther was confronted with the reality of the religion he described in theory, he reacted against it vehemently. Luther was not only vexed by the Roman Catholic Church that had excommunicated him, but also by Anabaptists, who insisted on putting into practice the idea that the Church was a community gathered by the Word. In many respects the Anabaptists were simply trying to live according to the theological principles by which Luther justified his revolt against the Roman Church. Their complaint with Luther, as Philip Lee observes, was that he was inconsistent. Luther redefined what “the Church” was to him, and his definition of the ‘invisible Church of those who hear and accept God’s Word’ has stayed with us to the present day, bringing us all the way through history from Germany to the question asked by my step-sister-in-law in present-day Manitoba, Canada, and thus has lead us back to what started this blog entry in the first place: would a pastor reading/studying the Bible and having revelations from God be in the Church? The reason why a question such as the one which leads to this blog post could even be asked after all the history has been sought through is due to multiculturalism (at least in Canada; cultural pluralism in the USA) and the heresy of the Ecumenical Movement. The many ways that this is clearly seen are diverse—through mixed marriages, converts, and even cradle Orthodox being secularised—yet all lead to the same confusion in correct ecclesiology. The problem with multiculturalism when it comes to religion is that most (all?) cultures have some religion connected to them, the culture being more the reason for the perpetuation of the religion—especially when (eventually) most of those within a culture no longer believe in the culture’s dominant religion, which is why when people ‘switch churches’ it’s rarely very ‘far’ from where they started: Mennonites and Baptists become Evangelicals and/or Non-Denominationalists; Lutherans and Anglicans become Catholics; Catholics become Orthodox, Lutheran, or Anglican; Orthodox become Catholics etc.. A good example: I know a man who confesses the truth of Orthodoxy, but being Italian and Catholic, won’t convert—because he is Italian! The point being that culture reinforces one’s earliest religion through the food, the religious music, and the memories of going to services with one’s grandmother so on and so forth: it’s sentimental. And for most, that’s enough to stay put. Most of us living today no doubt have grown up in the shadow of the Ecumenical Movement, with the Movement’s origins in the early twentieth-century it had already taken root and begun to spread by the time most of us reading this were even conceived. The problem with Ecumenism—and where its link to multiculturalism is most visible—arises when we see mixed marriages within the Church, as well as when we receive converts from amongst the heterodox; due to the Ecumenical Movement the zeitgeist—or our “Sitz im Leben,” if you will—that is indoctrinated upon all who are unaware of the theology behind the impetus of the Ecumenical Movement makes it next to impossible to extricate ones mind from the dominant worldview, which is that we all worship the same God (Muslims too), that the issue of salvation outside the Church is a non-issue because we are all in the Church, and dogma in unimportant because unity is what matters most. What initially started out as a question of ecclesiology is, as I hope has been made clear, actually a matter of soteriology. The ecclesiology of Martin Luther was an afterthought to his soteriology, and ultimately so—because when he redefined the soteriology of the Roman Catholic religion he was still in that religion of which he believed to be ‘the Church,’ one, holy, catholic (‘Christian’ in German), and Apostolic. While he was still in communion with Rome his understanding of what ‘the Church’ was had not had to be reconsidered, because his ecclesiology was the same as Rome’s; however, following his excommunication ecclesiology became a pressing issue of utmost importance for his soteriology, because as he himself has said: to find Christ one must find the Church first. But then, as we let this sink in, perhaps we come to think that if Luther’s ecclesiology was (and is) such a hastily assembled house of cards, maybe his soteriology before his excommunication was built upon sand and not upon the rock? The implications of such a question are far-reaching and nothing short of spiritually devastating if true. This false ecclesiology can be seen implemented timeline of the Reformation. Richard Rex: 95 Theses on Martin Luther and the Protestant Reformation – LXXXIX Luther invented the concept of the ‘invisible church’. 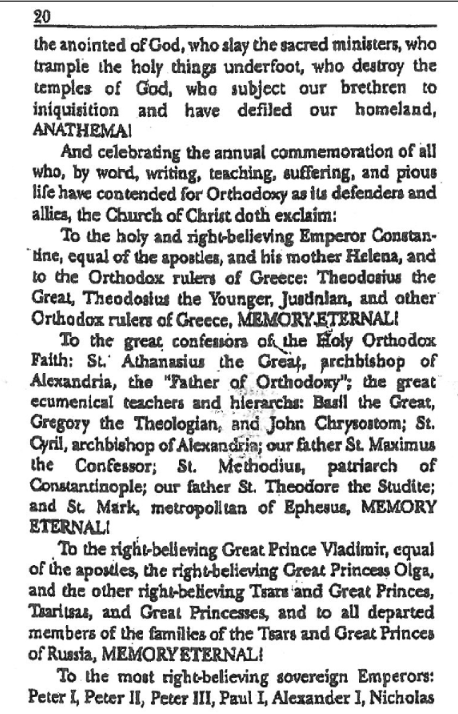 Let us grant that modern preachers of heresy are not so belligerent towards the Orthodox Church as the ancient ones were. However, that is not because their doctrines are nearer to Orthodox teaching, but because Protestantism and Ecumenism have built up in them the conviction that there is no One and True Church on earth, but only communities of men who are in varying degrees of error. Such a doctrine kills any zeal in professing what they take to be the truth, and therefore modern heretics appear to be less obdurate than the ancient ones. But such indifference to truth is in many respects worse than the capacity to be zealous in defense of an error mistaken for truth. Pilate, who said “What is truth?” could not be converted; but Saul, the persecutor of Christianity, became the Apostle Paul. That is why we read in the Book of Revelation the menacing words to the Angel of the Church of Laodicea: “I know thy works, that thou art neither cold nor hot: I would thou wert cold or hot. So then because thou art lukewarm, and neither cold nor hot, I will spew thee out of my mouth” (iii. 15-16). 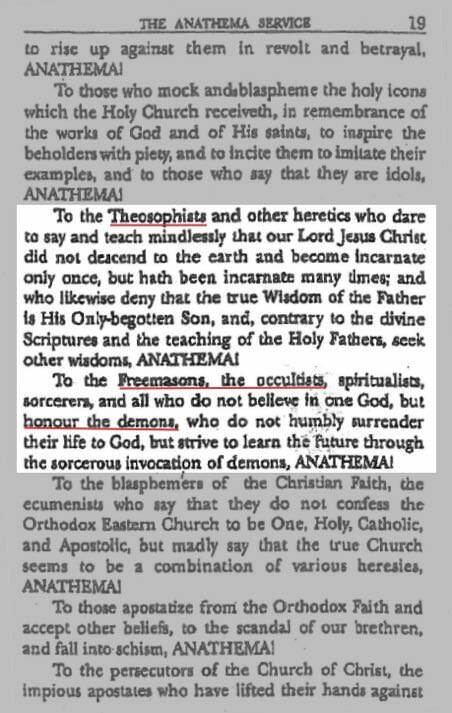 From time to time, heretics and schismatics have cut themselves off and have fallen away from the One and indivisible Church of Christ, whereby they ceased to be members of the Church and parts of Her Theanthropic Body. The first to fall away thus were the Gnostics, then the Arians, then the Macedonians, then the Monophysites, then the Iconoclasts, then the Roman Catholics, then the Protestants, then the Uniates, and so on—all the members of the legion of heretics and schismatics. Ἦσαν δὲ προσκαρτεροῦντες τῇ διδαχῇ τῶν ἀποστόλων καὶ τῇ κοινωνίᾳ καὶ τῇ κλάσει τοῦ ἄρτου καὶ ταῖς προσευχαῖς. It is common for people raised with a Western φρόνημα to look to Scripture in search of a counter to why heterodox faith traditions don’t believe certain tenets of the Orthodox Christian Faith. This is even more compounded when said people do not know Koine Greek and instead are forced to use Protestant translations of the Scriptures into English (which is itself a Protestant language, which further adds to the problem of arriving at a correct hermeneutic). The problem boils down to one thing: the approach is wrong. Orthodox Christians have never derived any dogma from Scripture; Scripture is the written record of the dogma which existed prior to it being written down. In the history of the Orthodox Church, it was always heresies that based their teachings on a novel extraction of portions of Scripture. We can see this with Gnosticism’s eisegesis of Scripture (q.v., St. Irenaeus), the Roman Catholic heresy of the filioque from St. John 20:22, Martin Luther’s novel doctrine eisegeted out of the Latin of Romans 1:16-17 (yes, novel. 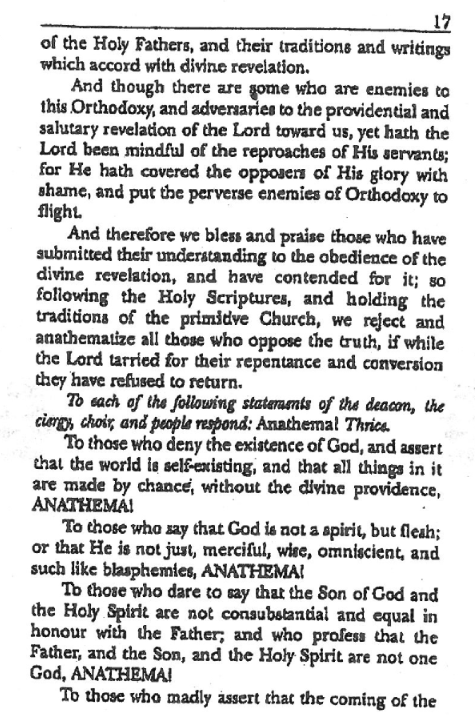 This why Philip Melanchthon had to strike out at the Church Fathers: this (new) doctrine is absent from them; therefore they were in error and Luther a prophet) and complicated further with his addition of “allein” in his German translation from the Koine Greek Textus Receptus. The sad irony in all this is that Luther himself believed in the perpetual virginity of the Theotokos, which is the topic of this post. 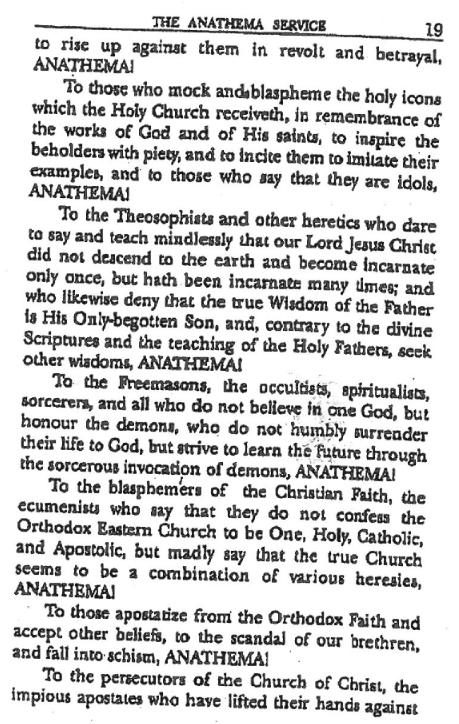 Failing to find Scriptural support in an English translation of Scripture for one’s ἀπολογία, one is forced into choosing a branch of theology as a hermeneutic. The thing is that no ἀπολογία is needed for the approach is off. For example, the Church has always believed in the perpetual virginity of Mary. When has She not? Even Luther knew this, and he knew it not from Scripture but from <<τῇ ἅπαξ παραδοθείσῃ τοῖς ἁγίοις πίστει>> (GNT-PT Ἰούδα 3), for it was “Quod ubique, quod semper, quod ab omnibus creditum est” (Vincentian Canon). It is sometimes said as an argument against the perpetual virginity of the Theotokos that it is not found in Scripture; hence the teaching was arrived at via a typological exegesis of the Septuagint; the problem with this is twofold. 1., it is indeed found in Scripture (even the great Greek grammarian, Baptist A.T. Robertson was mistaken on this—but this was because he fell into the fallacy that doctrine is built from Scripture rather than Scripture being the written record of a part of the Faith). And 2., as I have already stated, the teaching is not based upon arguments from Scripture, thus whether or not it is “found” in Scripture doesn’t even matter. This last point will become very clear when we get to Ricky Gervais and Stephen Colbert below. To elaborate upon No. 1., in the New Testament it isn’t explicit, but it is definitely clear in the Greek: καὶ οὐκ ἐγίνωσκεν αὐτὴν ἕως οὗ ἔτεκε τὸν υἱὸν αὐτῆς τὸν πρωτότοκον, καὶ ἐκάλεσε τὸ ὄνομα αὐτοῦ Ἰησοῦν. (Most?) Protestants look to ἕως and commit an exegetical fallacy by usually saying something like “ἕως means ‘until'” (C.S. Lewis would lose his shirt over this), and then also forget all the other uses of ἕως where it is very clear that it does not refer to a terminus, for example, Matthew 20:28 διδάσκοντες αὐτοὺς τηρεῖν πάντα ὅσα ἐνετειλάμην ὑμῖν· καὶ ἰδοὺ ἐγὼ μεθ᾿ ὑμῶν εἰμι πάσας τὰς ἡμέρας ἕως τῆς συντελείας τοῦ αἰῶνος. Ἀμήν. At the end of the aeon Christ leaves us? Further, in Matthew 1:25 above ἐγίνωσκεν is in the imperfect active indicative, so past continuous, not simple past (aorist). To quote Zerwick, “ἐ-γίνωσκεν impf of duration: ἕως would require constative aor. (§253) if indicating termination of action” (Max Zerwick and Mary Grosvenor, A Grammatical Analysis of the Greek New Testament (Rome: Biblical Institute Press, 1974), 2). Also, many Greek and even Latin Fathers are clear on the grammar, see for example Sts. Chrysostom & Jerome. Going by an English translation, then yes typology definitely makes the perpetual virginity more clear; however, in the Greek vis-à-vis Greek, it is clear. (1) I have continually given the greatest pains and diligence to inquiring, from the greatest possible number of men outstanding in holiness and in doctrine, how I can secure a kind of fixed and, as it were, general and guiding principle for distinguishing the true Catholic Faith from the degraded falsehoods of heresy. And the answer that I receive is always to this effect; that if I wish, or indeed if anyone wishes, to detect the deceits of heretics that arise and to avoid their snares and to keep healthy and sound in a healthy faith, we ought, with the Lord’s help, to fortify our faith in a twofold manner, firstly, that is, by the authority of God’s Law, then by the tradition of the Catholic Church. (2) Here, it may be, someone will ask, Since the canon of Scripture is complete, and is in itself abundantly sufficient, what need is there to join to it the interpretation of the Church? The answer is that because of the very depth of Scripture all men do not place one identical interpretation upon it. The statements of the same writer are explained by different men in different ways, so much so that it seems almost possible to extract from it as many opinions as there are men. Novatian expounds in one way, Sabellius in another, Donatus in another, Arius, Eunomius and Macedonius in another, Photinus, Apollinaris and Priscillian in another, Jovinian, Pelagius and Caelestius in another, and latterly Nestorius in another. Therefore, because of the intricacies of error, which is so multiform, there is great need for the laying down of a rule for the exposition of Prophets and Apostles in accordance with the standard of the interpretation of the Church Catholic. (3) Now in the Catholic Church itself we take the greatest care to hold that which has been believed everywhere, always and by all. That is truly and properly ‘Catholic,’ as is shown by the very force and meaning of the word, which comprehends everything almost universally. We shall hold to this rule if we follow universality [i.e. oecumenicity], antiquity, and consent. We shall follow universality if we acknowledge that one Faith to be true which the whole Church throughout the world confesses; antiquity if we in no wise depart from those interpretations which it is clear that our ancestors and fathers proclaimed; consent, if in antiquity itself we keep following the definitions and opinions of all, or certainly nearly all, bishops and doctors alike. (4) What then will the Catholic Christian do, if a small part of the Church has cut itself off from the communion of the universal Faith? The answer is sure. He will prefer the healthiness of the whole body to the morbid and corrupt limb. But what if some novel contagion try to infect the whole Church, and not merely a tiny part of it? Then he will take care to cleave to antiquity, which cannot now be led astray by any deceit of novelty. What if in antiquity itself two or three men, or it may be a city, or even a whole province be detected in error? Then he will take the greatest care to prefer the decrees of the ancient General Councils, if there are such, to the irresponsible ignorance of a few men. But what if some error arises regarding which nothing of this sort is to be found? Then he must do his best to compare the opinions of the Fathers and inquire their meaning, provided always that, though they belonged to diverse times and places, they yet continued in the faith and communion of the one Catholic Church; and let them be teachers approved and outstanding. And whatever he shall find to have been held, approved and taught, not by one or two only but by all equally and with one consent, openly, frequently, and persistently, let him take this as to be held by him without the slightest hesitation. The Chuch Fathers didn’t believe what they believed because they extracted it second hand from intellectual grappling of Scripture. To be sure, my point is that the belief in the perpetual virginity of the Theotokos is not derived from Scripture, rather it is known experientially by all baptized and chrismated Orthodox Christians through the Holy Tradition, guided by the Holy Ghost in the Church. Just to be clear, I’m not arguing against typology as a hermeneutic, in fact, I think it is great. But by the same token, we need to keep in mind that the Fathers actually knew the language in which their writings and those of our Scriptures were written in—Greek and Latin. This issue reminds me of a video I saw recently where Ricky Gervais and Stephen Colbert go head-to-head on religion. I have no clue who Ricky Gervais is other than that he is an atheist who shows up in memes on social media, but he said something here that is relevant to my point. He said that if all the holy books were destroyed, in a thousand years they wouldn’t come back as the same texts. This, of course, is only a problem for Protestants and atheists; for Gervais the reason why is explicit in the video, and for Protestants because their dogma is based upon various Reformers eisegesis of a specific “holy book.” Remove the book, and all you have is a dead false prophet. Mary’s Virginity and its Perpetuity in Biblical Typology By Rdr. Isaac G.